Happy Chinese New Year! Been super busy with mysalted egg yolk pineapple tarts for the past 5 days! Baking it fresh right before the new year! I'm glad I did it (with my friends taking turns to help) though not fully satisfied with the results, but am happy that most of my customers enjoyed the tarts! I may begin to sell more bake products in the near future. See how it goes~ The other day, my friend got me this jam from his work place - local produced jams made from fresh fruits- GSH Conserves. They have really interesting flavors combination and taste really good as well! I've got the dragonfruit & lychee jam from him and decided to whip up a Chinese dish to welcome this coming lunar new year! That deep purple tone and black seeds from the dragon fruit really add to the appeal of this dish. With real lychee fruits added in you can literally taste the fruits coated on the pork. 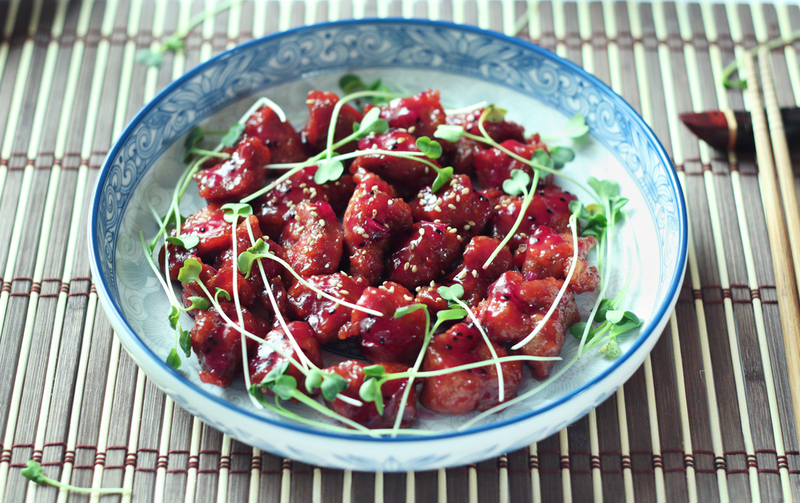 This is a spin off recipe from the classic sweet & sour pork that most Chinese love!!! Do try it out! You're free to substitute the jam to ketchup (or other kind of fruit jams - do some adjustment to thesauce ratio). Note: Classic Sweet & Sour Pork - 3-4tbs ketchup; ratio of vinegar to sugar 1:1 ; 1-2 tbs of water. Taste & Adjust accordingly. Marinate your pork with soy sauce, egg and sesame oil, put in fridge for at least 15mins to half an hour. Add in corn starch to mix only when you're just about to deep fry it. Heat oil in pot, aim for a medium high temp. Test by sticking a wooden chop in. If you start to see bubbles slowly sizzling at the tip, the oil is ready. Mix with corn starch and deep fry until light golden brown. The body of the meat should be lighter than when it's raw. Take it out and set aside but don't off the heat for the oil yet. You need to double fry it. After about 10-20 secs of resting. Deep fried the meat again for not more than 10-15 secs. The color of the meat should turn more brown and crispier. Take out and set aside. Prepare a pan, 2 tbs of oil, high heat and stir fry scallions and garlic till fragrant. Then lower heat to medium and add in your premixed sauce (taste and adjust first). The sauce should turn syrupy cause of the corn starch in the sauce. If it's not starchy enough add in more corn starch. Add in the deep fried meat and lightly toss and coat the sauce over. And you're done. When serving, I remove the scallions and garlic. Garnish with sprouts and sesame seeds . Here wishing you a Happy Prosperous Lunar Goat Year!! !